﻿ Where Do Deleted Files Go? It's Not A Secret Any More. Position: Home > Tutorials > Data Recovery Software > Where Do Deleted Files Go? It's Not A Secret Any More. Where Do Deleted Files Go? It's Not A Secret Any More. It's not a secret anymore after you read thoroughly the article: Where Do Deleted Files Go? It will guide you to recover permanently deleted files either with free data recovery software easily and quickly on your own. Where do deleted files go from hard drive/USB flash drive? No matter you are experienced users or green hand while operating the computer, laptop, the common action you must do is to delete files with purpose to release free space on hard drive or USB flash drive. Unfortunately, you might delete important files mistakenly while clearing the unwanted files. Where do deleted files go in Windows 7/8/10? Actually, after pressed delete button or right-click the selected files and then clicked Delete. Windows system just sent the files the Recycle Bin, you can right-click all of the selected files in the Recycle Bin and then hit Restore. After click Restore, all of the deleted files will be restored to the original location. Therefore, you can easily get back the deleted files. Sometimes if you cannot find the files in the target location, simply check the Recycle Bin to find them there. Where do deleted files go after permanently deleted files? 1. Emptied the Recycle Bin. 2. Selected Don't move files to the Recycle Bin. Removed files immediately when deleted option. 3. Pressed Shift+Delete button to delete the files directly. 4. Use third-party software, such as using CCleaner to delete the files without sent to the Recycle Bin. Don't be anxious after the files disappeared, actually, the files still exist there and let's take a look at the reasons. Why can the files be recovered after permanent deletion? Before you save the large file on the hard drive, flash drive or any other storage device, that file will be divided into two parts – content and parameters, the parameters are generated for indicating the file's location, size and other information. When you open the files, the system follows the parameters to pull up the data. Or the system deletes the parameters when deleted the files permanently, that's why the files disappeared due to the loss of parameters. How to recover permanently deleted files with free data recovery software? As we have known that the system just deleted the parameters of the files, but the contents still exist there on the hard drive, USB flash drive or any other storage device, which means we still have the chance to recover permanently deleted files by following steps. Step 1. Download and install Bitwar Data Recovery, and then launch the software. Step 2. Choose the hard drive, USB flash drive or other devices in the interface of software, and then click Next. Step 3. Select the Scan Mode. You can choose Quick Scan to search permanently deleted files with conditions of file path, file type, original file name and last modification time in the scanned results. Step 4. 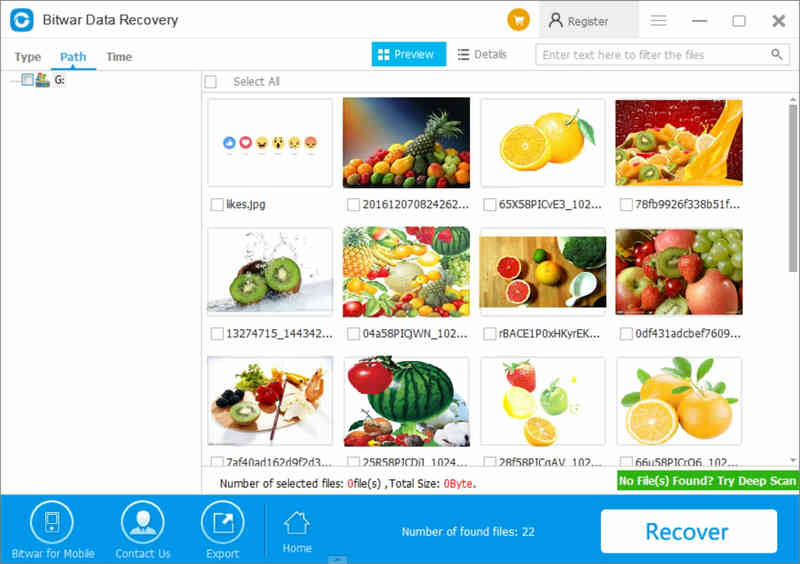 Choose the file of types; you can use Bitwar Data Recovery to recover photos/images, video, audio, documents and archive files, etc. If you have no idea what kind of types need to choose, simply select all types. Step 5. Double Click to preview the files and then hit Recover to save the files. The software supports to recover the deleted files with original folder structure. As you can see, you can stop asking about where do deleted files go? Even more, you can save money on hiring data Recovery Company to recover deleted files for you. Because Bitwar Data Recovery it's a powerful data recovery tool that supports Recycle Bin recovery, format recovery, accidental deletion recovery from hard drive, USB flash drive, SD card, external devices for free in 30 days without hidden fee or limits on recovery amount. Recover what you want with Bitwar Data Recovery now. Previous：How to fix "Windows was unable to complete the format"
Summary：Follow the tutorial to recover data from external device that cannot be formatted and fix “Windows was unable to complete the format” step-by-step. Next：How to Recover Raw Partition Without Losing Data for Free? Summary：How to recover raw partition without losing data for free is a quite concerned question among our users. And today in this article we are going to tell about recover raw partition issue.